The Kenmore brand of appliances has been sold by Sears since 1927. The name was first used in association with sewing machines and eventually led to a huge line of various appliances. From microwaves to dryers, wall ovens to dishwashers, Kenmore has a broad standing in the market. Today nearly 1 in every 3 households has a Kenmore appliance of some kind. The Kenmore brand boasts powerful performance for all their appliances. Even with the promise of performance, Kenmore appliance can still malfunction. When this happens it’s time to call Action Appliance Repair. With over 50 years of experience, Action Appliance Repair is focused on providing the best customer service possible. Since 1961 our family-owned and operated business has provided a knowledgeable staff of service technicians to customers throughout the area. We know a broken appliance can have a major impact on your everyday life. Let Action Appliance Repair take the stress from your shoulders and provide you with excellent service and courteous customer care. Our commitment to service has kept our customers returning year after year for their repair needs and we are proud to continue this excellence. When your Kenmore appliance is in need of repair then call us toll free at 866-611-4479. We make sure you get the best service and price in town. We even provide your service call at no charge to you with each repair we make. If you suddenly find yourself with a broken Kenmore appliance then call Action Appliance Repair for the best service. Our highly trained technicians have the knowledge of repairing luxury appliances such as Kenmore and will leave you with the peace of mind knowing your appliance is being tended to with care. Along with this service, we also proudly offer our customers a 5 year pro-rated parts warranty. So what does calling Action Appliance Repair for your Kenmore appliance mean for you? We waive the fee of our service call if we repair your Kenmore appliance. 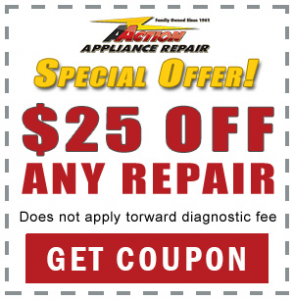 You won’t owe us anything if we visit and are able to repair your appliance.